As I left Selhurst Park on Saturday, I was in traffic following Crystal Palace’s win in the Premier League. A huge car pulled up and I allowed the driver to pull out into the road. It was Wilfried Zaha. The shades were on, the music was blaring, and why not after he helped his club to victory. I know some Brighton fans see him as their nemesis and he seems to save himself for the games against their rivals but that’s not what I’m writing about here. Zaha is a local lad. He knows how important these games are. He also appreciates what they mean to the fans. It isn’t of course his only spell at the club. He was Sir Alex Ferguson’s final signing at Manchester United but made just four cameo performances. It didn’t work out. Now he is back at a place (no typo!) and a club where he feels at home and he is thriving again. He isn’t however the only one. Leading out the Seagulls was Brighton boy Lewis Dunk. The 26-year-old has matured over the last few years, on and off the pitch. He has caught the eye of many top clubs but will he stay? If the Albion were to go down, his departure would seem inevitable. However, as this now looks less likely what will happen in the coming seasons? Chief executive Paul Barber reiterated the club’s desire to hold on to the best players but that’s not always possible. Nowadays there are very few players who spend their whole, or the vast majority of their career, at one club. Matt Le Tissier made more than 500 appearances for Southampton, scoring over 200 goals. Some say he should have moved to what they perceive to be a ‘bigger’ club but the now 49-year-old was a huge talent and just seemed happy at Saints. Is Will Grigg the perfect fit for Wigan? And it’s not just players. Eddie Howe just seems right as the manager at Bournemouth. 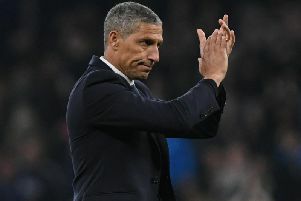 He may be touted as a possible future Arsenal boss but he may well become one of the longest serving managers in the country one day on the South Coast. Dunk is already past 200 games in an Albion shirt and it may well suit him to remain at the Amex for years to come. Both Dunk and Zaha knew what Saturday’s game meant and may have more in common than they think. Don’t get me wrong, it is not to say that Dunk could not play for one of the top six clubs but it would not surprise me if he became one of the club’s longest-serving players. There are less games now especially as the Seagulls are in the Premier League but he has been with the Seagulls for nearly a decade and it has been interesting to chart his progress. The next ten years may well be just as intriguing, wherever he spends them.